Wellness is the aim at this resort – with spa, detox and healthy living packages. And with such exquisite surroundings, how could mind, body and soul not be rejuvenated? 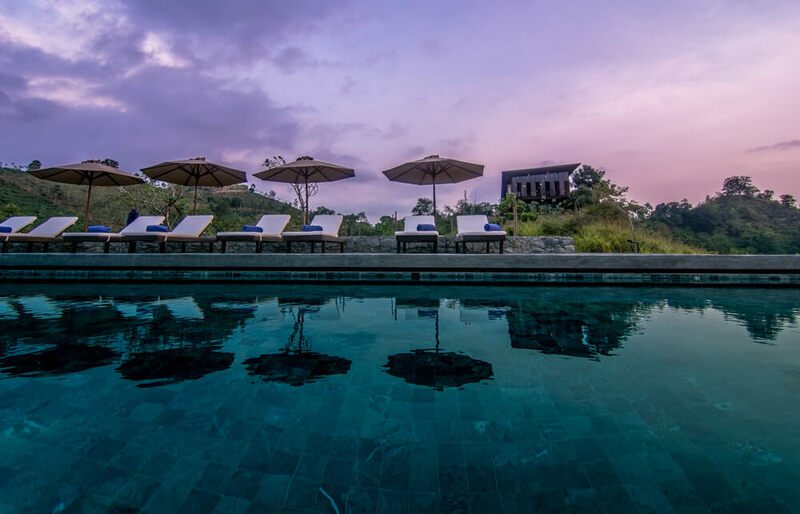 In the central hills of Kandy – Sri Lanka, Santani Wellness Resort & Spa is nestled amidst a mountainous jungle in an abandoned 48 acre tea estate. 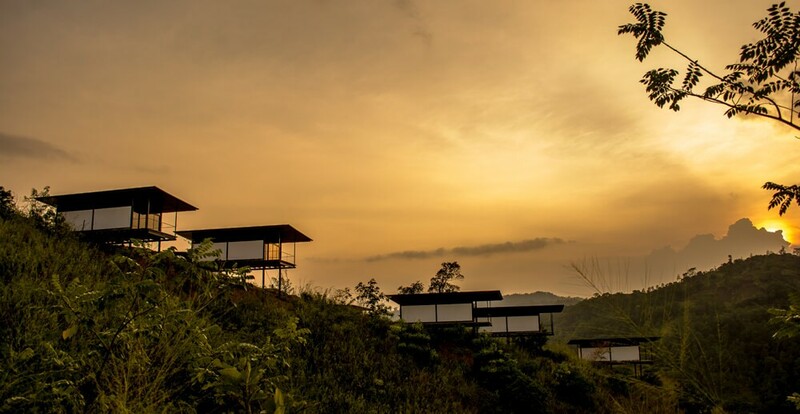 This beautiful resort boasts simplicity along with nature integration – a concept that recalls the tropical modernism of legendary architect, the late Geoffrey Bawa. Thisara Thanapathy Associates are the expert architects who have designed this exclusive 18 villa property which is both magnificent and intimate. The aim was to have a ‘non-building situation’ and make guests feel ‘one with the environment’. Hence to highlight the beauty of the surrounding environment, the architect sticks to simplicity in designing the building itself. The hotel is built with glass walls and huge lounging spaces that are proportioned in a way that offers splendid views of greenery and calm mountains that disappear into the view. 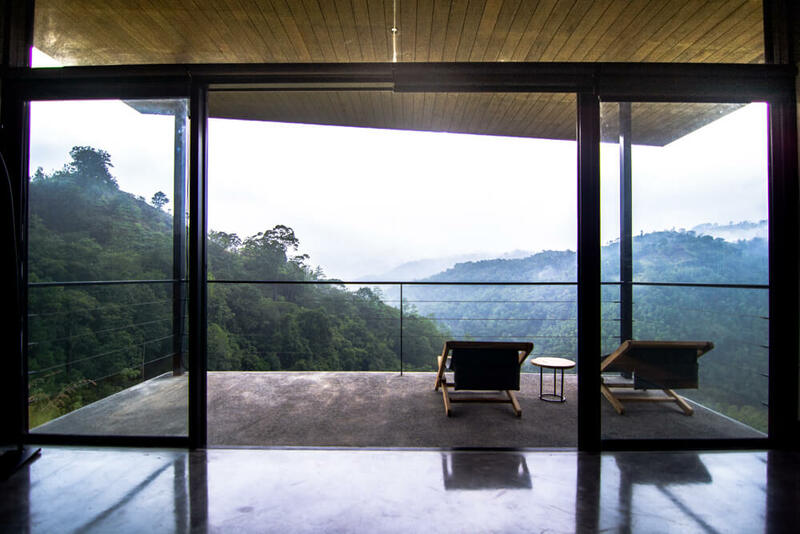 The intimacy comes in the design of elevated chalets – Kandyan inspired metal and timber cocoon villas within light, minimalist pavilions which seem like they are floating above the greenery. The reason for these elevated structures, according to architect Thanapathy, is to minimize the impact on the eco system and also to make the structure resistant towards flooding. The main complex comprises three stories within which there is the reception, restaurant, a spa, a cedar wood sauna and a hydrotherapy swimming pool. Guests can also converse with visiting masters and obtain expert tips on lifestyle wellness. In fact the kitchen’s nourishing menu is customized based on the Ayurvedic condition of each guest! Forget TV while you are at Santani. None of the rooms have screens. But Wi-Fi is available so you are not completely isolated from the rest of the world. The heart of Santani Wellness Resort is the SPA – which is Sri Lanka’s one and only purpose built wellness resort. More accurately located in rural Werapitiya, the resort is just about one hour’s drive from the cultural capital of Kandy. The spa building is much more subtle than the other parts of the resort. The building is seen as a collection of green terraces aligned with the slope of the land – looking much like paddy terraces. At the ground level are two pavilions built on pillars – resembling Kandyan vernacular structures. The path that leads you to the lower levels is a tunnel in the pavilion. When walking through this narrow passageway, it seems like you are going into a cave. The first level is where the steam room, the cedar wood sauna and the open air thermal salt-soak pool is located. Through the glass walls of the sauna, one can indulge in the views of lush paddy fields and the stunning Knuckles mountain range in the distance. The lowest level of the spa has 3 ayurvedic therapy rooms that offer views of the surrounding paddy fields on one side. The treatment rooms and passageways are made with rubble walls – which add to the cave-like feel of the building. 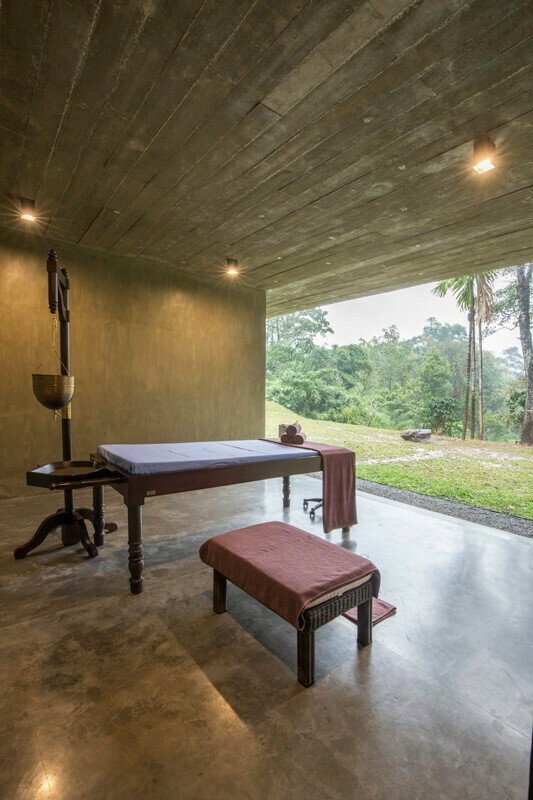 According to architect Thanapathy, the Spa at Santani embodies a strong principle that he believes in: “Architecture should be built around the lives of people (ideas of Prof Christopher Alexander). The design should capture the spirit of the place.” This exclusive spa design was shortlisted for the Geoffrey Bawa Award for Excellence in 2017.